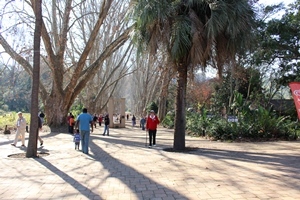 The visitors’ complex frames the entrance to Plane Tree Avenue and is reached from the parking area via a bridge across Magazine Spruit. 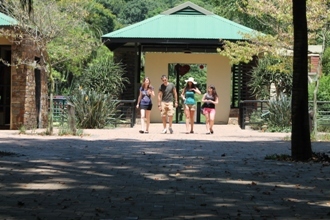 The ticket office opens onto a large paved area which provides a rendezvous site for visitors. 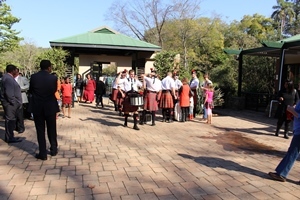 The restaurant, complete with a large open fireplace and air conditioning, has scenic views across the Garden lawns and the Grand Old Trees section of the garden. 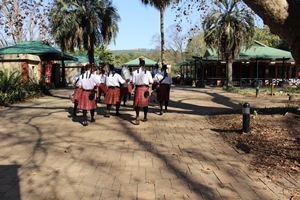 An information centre, Kiosk, children’s playground and toilet block are also situated in the complex. The eyed pansy is a widespread but uncommon butterfly, and its visibility peaks between August and November, and February and March. The larvae feed on Plectranthusand Thunbergia species.